The value of a Votes for Women, 1917-1967 - 5 cents 1967 stamp depends on several factors such as quality and wear, supply and demand, rarity, finish and more. Values in the section are based on the market, trends, auctions and recognized books, publications and catalogs. This section also includes information on errors and varieties and characteristics. 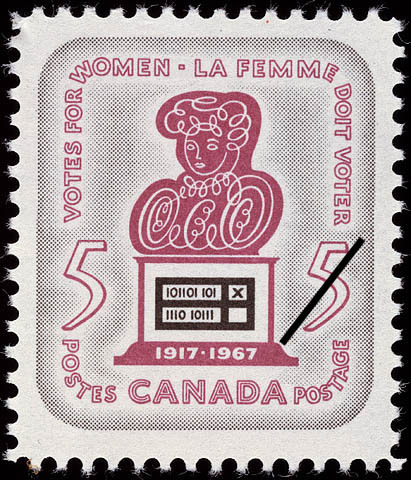 Initial acceptance of the principle of political equality for women in Canadian Federal elections is commemorated by this stamp to mark the 50th Anniversary of the granting of the franchise to women. Women first emerged as a factor in the result of national elections when the 1917 Wartime Elections Act granted the vote to those women who had close relatives in the armed services. Complete federal enfranchisement came in 1918 thereby culminating a struggle for equality which had its origin in the 1870's. The right of women to express their opinions through the ballot box had gained momentum in 1916 when the Provinces of Manitoba, Saskatchewan and Alberta became the first to grant political equality. Early in 1917 British Columbia granted the same right and a few weeks later Ontario became the fifth Province to provide necessary legislation, Nova Scotia enacted the desired law in 1918, shortly before passage of the Act at the federal level. New Brunswick enfranchised its women in 1919 and Prince Edward Island took similar action in 1922. Historians have noted there are records of women voting in Quebec in the early 1800's; the right was later denied to them and not restored until 1940. In Canada's newest Province women were granted the right to vote 24 years before Newfoundland joined Confederation in 1949. As an extension of women's right to vote, the right to seek election to the House of Commons was accepted in 1919, this tentative acceptance was not made permanent until 1920. The principle of women being named to a seat in the Upper House, or Senate, was the subject of a continuing debate which was not resolved until 1929 after a successful appeal to the Privy Council. At the provincial level, women found it easier to achieve the right to seek election to their legislature. Ontario and New Brunswick were the only Provinces which did not concede the right to a seat in the same year as they granted the provincial franchise. New Brunswick withheld the right to election until 1934 and Ontario granted the right in 1919. The achievement of political equality did not mean an early entry of women to the Federal Cabinet. It was not until 1957 that this goal was first attained.